* Comes complete with a PVC zip up bag for easy storage. 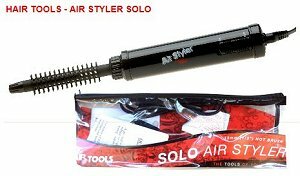 The Solo Airstyler has a 13mm size hot brush. This item is an airstyler which means that air is blown down through the barrel of the brush allowing you to dry damp hair as you style. Rather than trying to hold a brush in one hand and a dryer in the other, this simple little styling tool combines the two, making styling and drying your hair so much easier. Towel dry hair significantly, divide off sections of hair, coil hair round the airstyler, hold in place until dry, uncoil hair and allow that area to cool before moving on to next section. Once each section has been coiled, dried and cooled, brush out entire hairstyle with a hairbrush and shape accordingly. Can be used on dry hair.